Yonge Dundas is quite a populated area, so it’s understandable that there are many restaurants around the area for people of the downtown core, or visitors of the 6ix to cater to the hungry tummies of the hustle and bustle of civilization. 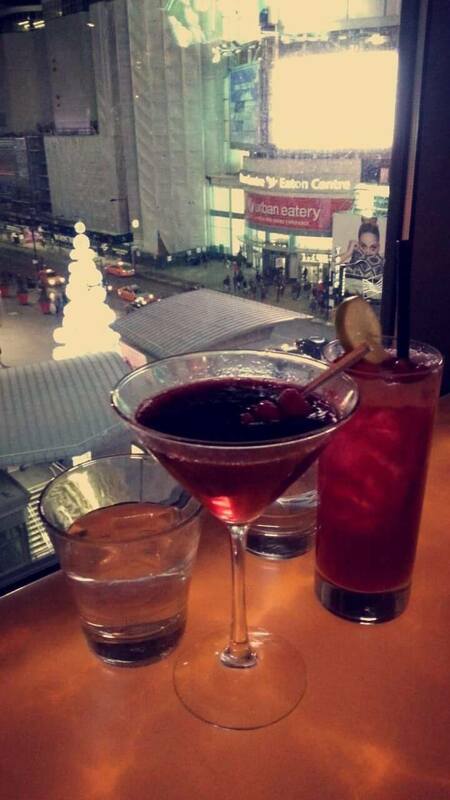 Back in December, around the spirit of Christmas time, my girlfriends and I made a trip to this restaurant looking over the Yonge-Dundas Square at Milestones, which is a modern restaurant serving quality foods and beverages. 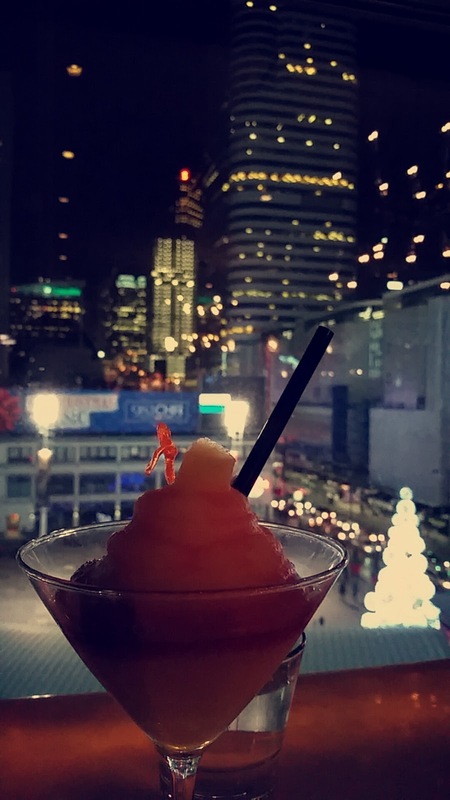 Milestones has many locations across the GTA, however none can beat the location right in the 6ix! 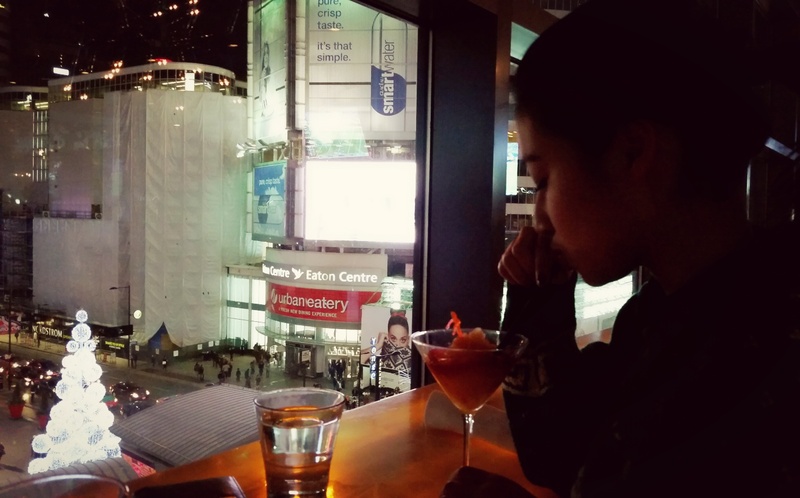 To begin our night out at Milestones, we got lucky with probably the best seats in the house – we ended up on a balcony ledge overlooking Yonge-Dundas Square and we could see the great city-life below in the winter evening. 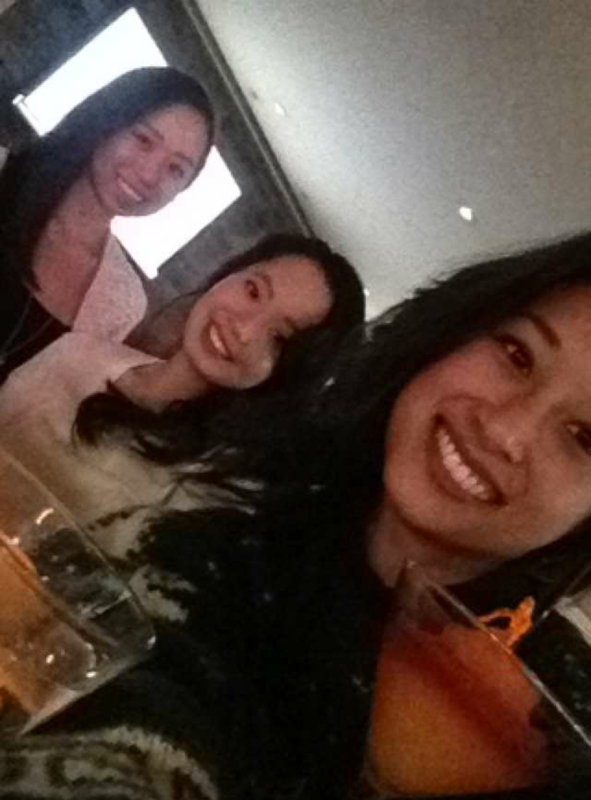 We order ourselves drinks and enjoy the view before dinner came out. 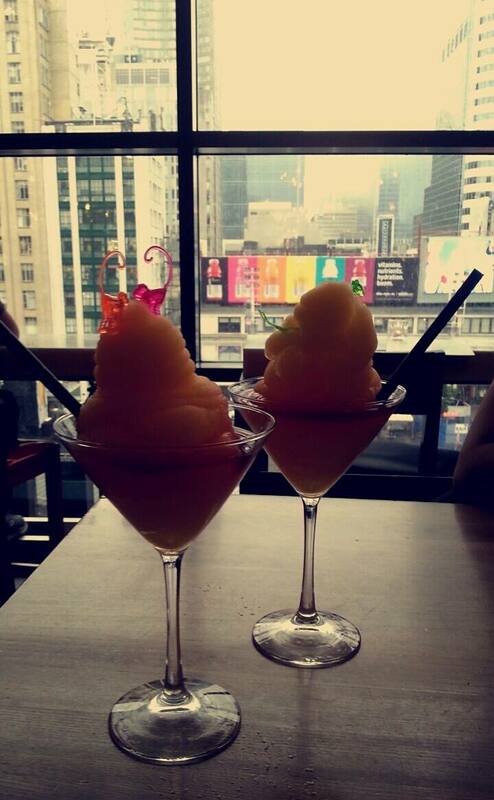 I got myself an Original Bellini, which was by far, my favourite mixed drink I had in Toronto. The Original Bellini is a celebrated drink of Milestones – it is a frozen blend of premium white rum, peach liqueur, sparkling white wine and topped with Boone’s Sangria. It was very refreshing, and the perfect amount of sweetness. I also like the presentation of the drink – it was perfect for photo taking (you can see that in the pictures shared here!) and curb the quenching thirst I had. My friend Sonya, ordered herself the Caesar Drink – which has Smirnoff’s No.21 vodka, fresh citrus, 8 spice rum, Walter All-Natural Caesar Mix and their signature blend of vine ripened tomatoes.This is found alongside her dish for the evening, Crispy Chicken Sandwich which had Crispy Cajun Batter and Sriracha slaw. Advice from Sonya to you however on the Caesar drink – do not order this drink! The drink was “gross” and tasted like drinking pizza tomato paste. So if you’re into tasting liquid pizza… go right ahead and order this (although I wouldn’t suggest this – just order yourself a real pizza and be done with it). The Crispy Chicken Sandwich however, seemed to satisfy her cravings for the night. On her recommendation on drinks – Sonya’s suggestion would be the Cosmo which is a Napa Valley blackberry puree hand-shaken with Smirnoff’s vodka, hibiscus infused lime and white cranberry juices. 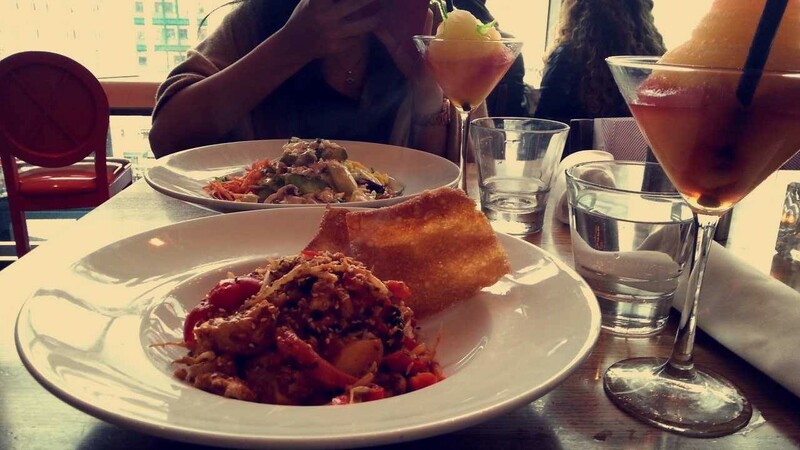 Overall, Milestones is a great urban setting, which is a must to visit during the evenings with your friends, family or anyone in between. It is a spectacular social setting if you want privacy, but at the same time the feel of community and city life. 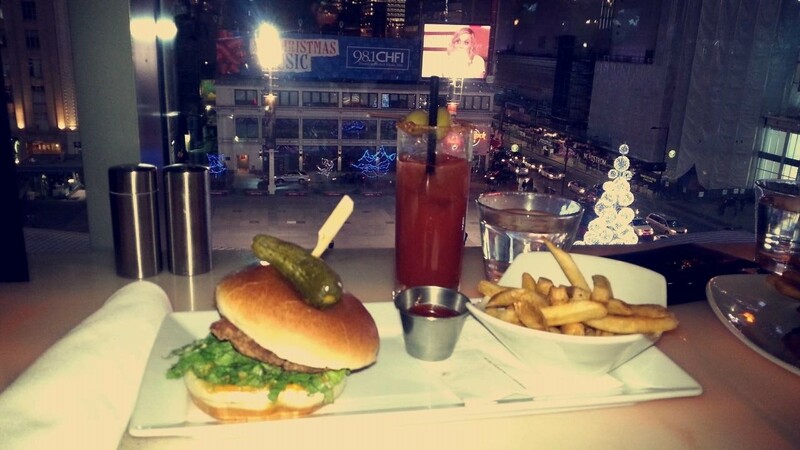 Especially at the Yonge Dundas location, where you can get a wonderful view of the city’s square and the Toronto Eaton Center.